A $35,000 grant will renew support of Fox Meadow’s pilot project and initiate MakerSpace programs in the other four elementary schools in 2013-14. The budget includes $7,500 each in four new schools and $5,000 to improve Fox Meadow’s existing program. MakerSpace’s goal is to prepare students to embrace innovation and entrepreneurial enterprise. The MakerSpace Program encourages experiential learning, communication, creativity, collaboration and critical thinking. Creating a dedicated physical space and engaging teachers, students and parents have been important elements in the success of the program in its first year at Fox Meadow. Student projects have included work on robotics, circuitry and use of a 3D printer. The pilot program in Fox Meadow was funded by the Center for Innovation in December 2012. Construction and equipment purchase took place in January and February 2013, with a ‘soft launch’ in March. The program is housed in a large closet – renovated with new flooring, freshly painted walls and added shelving to create a welcoming environment for students in grades 2 through 5. In its first three months of full operation, the program has proven to be popular with students and teachers alike. 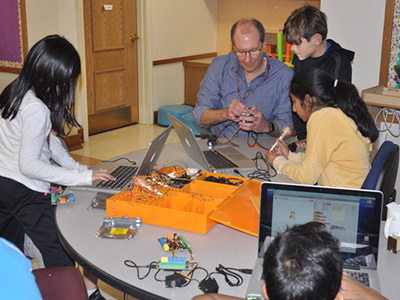 Fox Meadow’s MakerSpace was developed by Peter McKenna and Principal Duncan Wilson, with active participation by many other teachers in the school. Activities in the 2012-13 school year initially involved third graders undertaking pilot activities in small groups working on prototype projects. Then second grade classes joined the program, along with fourth and fifth graders doing modeling activities with the 3D printer. Scarsdale’s MakerSpace program is the only one of its kind that we are aware of in a K-12 public school system. Fox Meadow computer teacher Peter McKenna has been invited by the Tech Forum and Technology and Learning magazine to talk about his experience with the program this Fall at their annual conference for the Northeast Region. 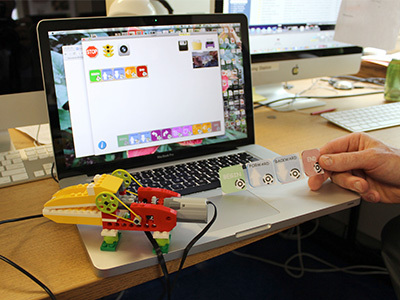 Looking ahead to the new school year, all five elementary school principals have embraced the idea and look forward to the opportunity to begin MakerSpace Programs in their own schools. Launching new programs in four elementary schools. Completion of some additional construction in the Fox Meadow space. Development of a pilot program at Fox Meadow that would take place mornings before school, and involve parents/guardians and students working together on projects. Exploration of the idea of having students work in the space at lunchtime, possibly with parent volunteers and teachers. Development of a "Maker Movement" course through the Scarsdale Teachers Institute, to be offered to all teachers in the District. Please view a Comprehensive Report on Makerspace Usage in all five elementary schools, as of January 2018. This project was a collaboration between Lisa Forte (Music Teacher) and Matthew Fitzpatrick (Art Teacher) at Edgewood Elementary School in Scarsdale, NY. The goal of this project was to combine music and art in order to teach Kindergarten students the principles of circuitry through the embodiment of sound. Students explored the art of Wassily Kandinsky and the musical composition was composed by Lisa Forte. In the music room, students gained awareness of pitch, rhythm, tempo and dynamics by embodying melodies/loops ("put the sounds in their bodies") through movement. In the art room, we listened to the same melodies/loops and interpreted these sounds into color, line, shape and form. Using conductive paint, students outlined their (elements) painted lines, shapes and forms. Each painting was hooked up to a MaKey MaKey circuit system, which is plugged into a computer that has Scratch software programmed to play each melody/loop separately. This process allows each element to play the same melody/loop when the painting is touched and the circuit is completed. Students experimented with a circuit box, which utilizes a MaKey Makey. Students then drew circuit designs in pencil. They hooked their drawing up to the circuit box, touched the ground wire with one hand and their drawing with the other. If their circuit was complete a sound played, if not they had to experiment independently to find out why. Once they had a complete understanding, they then went back to their Conductive Kandinsky painting to fix any missed connections or errors.